OXO sent me a complimentary set of their 14 Piece Glass Bake, Serve & Store Set. You’ll see them in this post because I love them! Make your own homemade freezer-friendly Teriyaki Chicken Bowls! They are fast, easy, and 100% customizable. 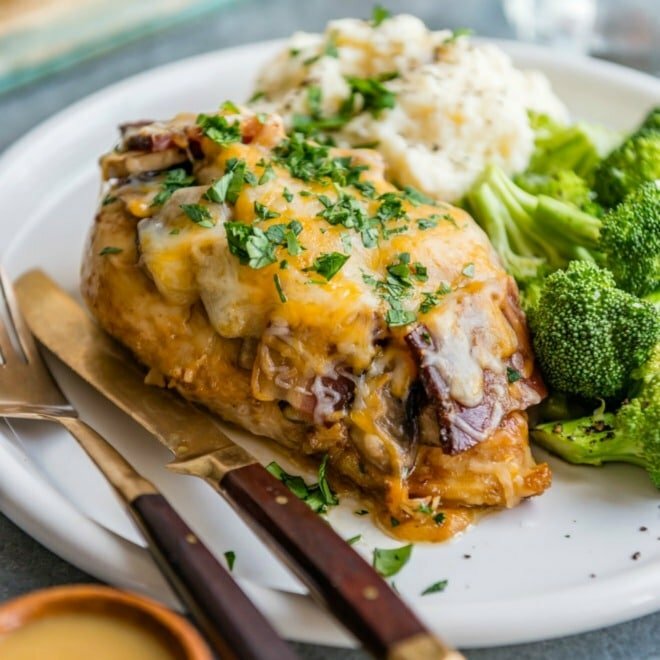 You can put your leftovers to work, too! On a recent trip to a warehouse store, I discovered a frozen Teriyaki Chicken Bowl. 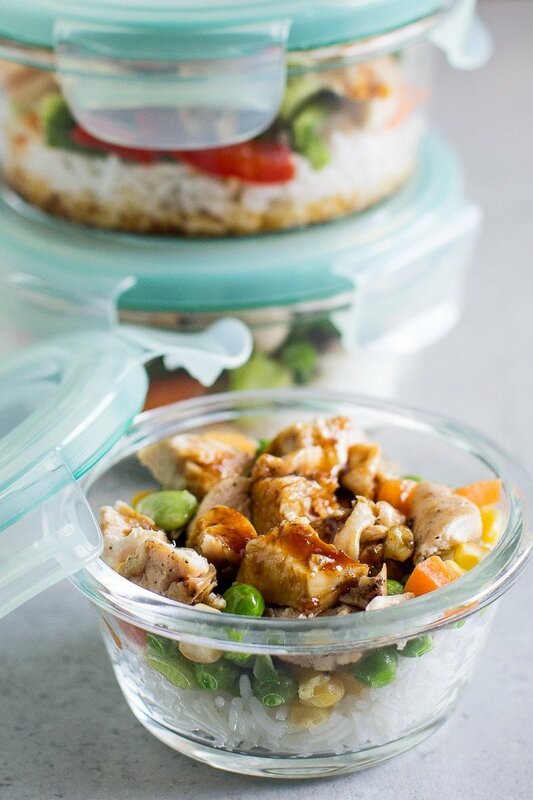 Chunks of chicken, rice, veggies, and a teriyaki sauce in a convenient freezer-to-microwave bowl. Heat it for a few minutes, they say, and you have an instant meal. The kids gobbled up their samples and I did, too. We bought a case! I was so excited to have an instant meal solution stashed away for a rainy day. Unfortunately, the Teriyaki Chicken Bowls were mostly smoke and mirrors. Without smiling employees, tiny spoons, and grumbling tummies to masque the mediocrity, we were left with a bowl of dry chicken, mushy vegetables, and a flat sauce. My mission was clear. With a winning Teriyaki Sauce already in my tool belt, I knew I could make a homemade, freezer-friendly, DELICIOUS Teriyaki Chicken Bowl in a snap. This Teriyaki Chicken Bowl allows you to enjoy your leftovers in a fresh, new way. As if they aren’t even leftovers at all. And since it takes the same amount of time to make 1/2 cup rice as 2 cups rice, I always make more than I need. Same with chicken. If I’m firing up the grill, I make the whole package. That way, the chicken is ready for salads, wraps, or Teriyaki Chicken Bowls. My Homemade Teriyaki Sauce is sweet, simple, and easily made ahead. I prefer to make it the night before so by morning, it’s extra thick and saucy. Whether customizing for kids means you use more veggies, fewer veggies, or different veggies, let this bowl be your canvas. I buy a frozen Chinese stir-fry vegetable blend for myself (bell peppers, green beans, broccoli, carrots, onions, and mushrooms), and a basic frozen mixed vegetable blend for my kids and husband (peas, carrots, corn, and lima beans). 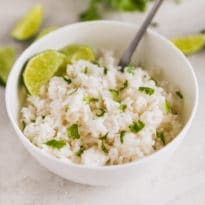 The selling point of this recipe is that you can prepare the bowls in advance, stick them in the freezer, and then transfer them straight to your microwave. 5 minutes later, you have a tasty homemade meal you can feel good about. 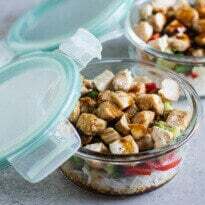 OXO created a line of glass dish just for food storage, and they are ideal for my Teriyaki Chicken Bowls. I use the 2-cup bowl for an adult-sized serving and the 1-cup bowl for a kid-sized serving. I started with 1 pound raw chicken which turned into just over 2 cups cooked chicken. I had enough for 4 adult bowls and 1 kids’ bowl. But, the yield is approximate and flexible. You can stretch the ingredients as you see fit. I am writing the recipe for 4 adult bowls to create order in a world of chaos. I included notes at the bottom of the recipe for building and heating a kid-size bowl. 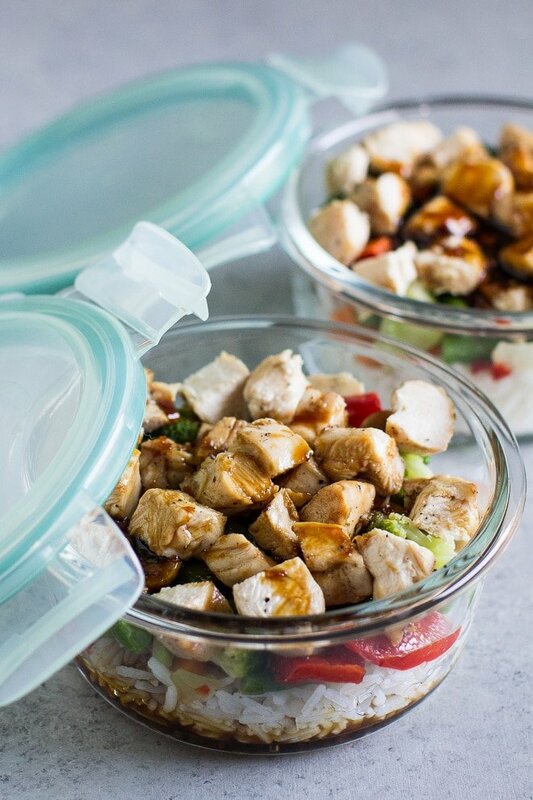 Save this Teriyaki Chicken Bowl (Freezer Friendly) to your “Main Dishes” Pinterest board! Put 1 cup rice in the bottom of each OXO Glass Food Storage 2-cup bowl. Top each with 1/2 cup frozen vegetables, 1/2 cup chicken, and 2 tablespoons teriyaki sauce. Cover and freeze. To reheat, transfer directly to the microwave. Unsnap lid fasteners and microwave on HIGH for 5 minutes. Let stand 2 minutes in the microwave. Stir and serve. If any frozen vegetables are big (full-sized green beans, for example), cut them into bite-sized pieces. Store-bought teriyaki sauce or your favorite stir-fry sauce may be substituted for the Homemade Teriyaki Sauce I have suggested. 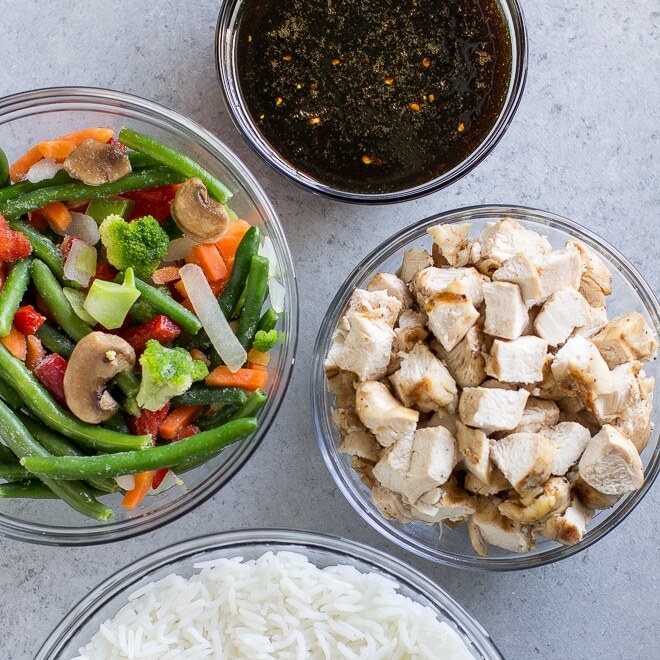 To assemble a kid-sized bowl, use 1/2 cup cooked rice, 1/4 cup frozen mixed veggies, 1/4 cup cooked chicken, and 1 tablespoon teriyaki sauce per bowl. Reduce cook time to 3 minutes; let stand in microwave 1 minute before serving. This recipe has been created for and tested with the OXO Glass Food Storage bowls with snap lids. If using different containers, your heating times and results may vary. 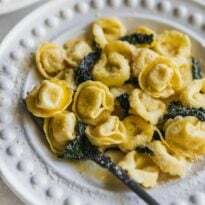 There are so many cool things to say about this recipe, Meggan – I really wouldn’t know where to begin! Thanks for this one kid. What amuses and amazes me is that a lot of people think that prepackaged stuff in the big box stores is good food. Sometimes it is. But……. Take it back. There’s nothing like homemade. Finally, a to-go lunch that won’t bore me to death! Cannot wait to try this out! I almost feel silly for asking but when using frozen veggies that haven’t been precooked, does one need to worry about them getting fully cooked? Most bags of frozen veggies say they need to be cooked for at least 5 minutes to be fully cooked and kill anything that may have contaminated them during packaging process. If they get microwaved for five minutes when mixed in with the chicken and rice, do you think they’ll still cook all the way through?